Some well known schematics which was widely used by manufacturers was described in: "The influence of schematics on power amplifier parameters". Here some interesting schemes are added. So it is a somewhat "part 3" of that article. The next parts may appear: the mankind has created much! All schemes are simulated with Electronics WorkBench (EWB) and are not for immediate implementation in real projects, but is a kind of mental pabulum. All amps are non-inverting (as before), though inverting amps have some advantages. As before every subsequent scheme is a result of evolution of the previous one or some of the previous. The amplification factor of all schemes with negative feedback (NFB) is 100/3+1=34.33. The power source voltages are+_50 V, except the third one, where they are +_30 V.
There can be some other schemes with two differential stages. The first stage is the differential pair with cascode. The second stage is a differential pair with split current source and current mirror. 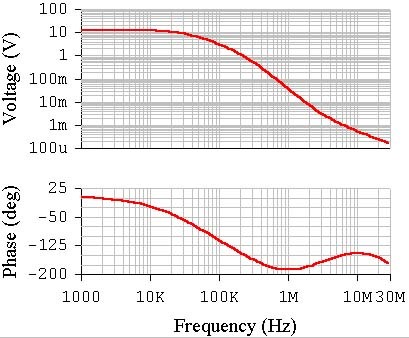 This topology has 4 times more gain, than the second amp from "The influence of schematics on power amplifier parameters. Part 1" - the amplifier with current source voltage amplifier stage. The second stage can provide the maximum amplitude load current equal to double collector current of each transistor in the pair. That means that the collector current can be lower than in a stage with single transistor (accordingly the power dissipation is lower too). The scheme without cascodes in both stages is possible too. The input voltage amplitude is 1 mV. The open loop gain is higher than 10 000. 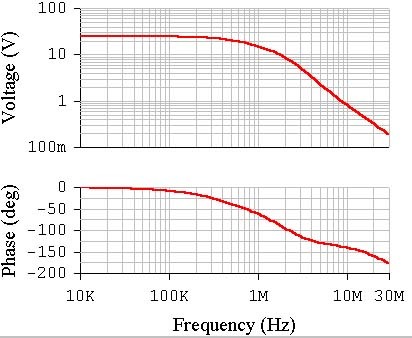 The open loop bandwidth of the amp is higher than 30 kHz. And it is good! The amp is stable as can be seen. Such schematics was used by "Electrocompaniet" and was designed by Otala in 1973. It must be mentioned that all transistor schematics was designed in seventies. The interesting site of the former employee of this Scandinavian company with schematics: www.home.sol.no/~tersands/schematics.htm see: [LINKS]. A somewhat like schematics was used in ВА-6000 amplifier by Fischer at the beginning of the eighties. A hybrid of the two amps is shown here. I couldn't make the amp stable as was in the Electrocompaniet amp so the 2 more frequency compensation capacitors are used in the third stage. The DC servo amp and NFB circuit capacitor are not shown simply because of image space limits. The amplitude input voltage is 10 uV. The amp is relatively stable. The open NFB loop gain is a little less 100 000! The rolloff of the gain graph is at 7 kHz. If the overall gain is made less the gain graph can be made flat till 20 kHz or more (as it was done by Electrocompaniet). The THD will be slightly higher than. As can be seen from the graph, the amp is relatively stable. It would be hard to achieve stability in a real project. 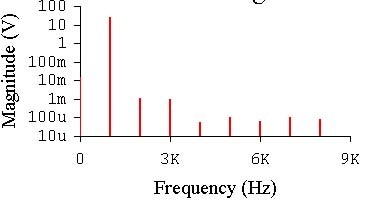 The THD at the input voltage 0,7 V (40 W at Rload=8 ohms) is 0.0055% and 0.0054% at 1 and 20 kHz respectively. This is the result of a three stage design and the lead correction. The output transistors quiescent current is about 140 mA. It must be mentioned that using the lead correction we can dramatically increase the frequency range and reduce THD at high frequencies. 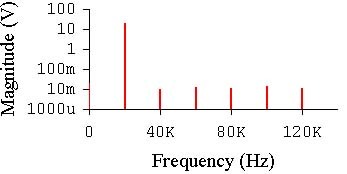 All the previous amps were subject to high THD at 20 kHz. This topology differs from everything that was described before. It was useful when high power complementary transistor pairs were scarce. So the special second differential stage made it possible to use only npn devices as output and even driver stage! The scheme is thermally unstable. So it can not be implemented "as is". The means of eliminating this shortcoming - see below. The first stage was described before. A simple differential stage with resistive load can be used too. The second stage is a resistive load differential pair but the load resistors are connected to different rails: the output and negative power supply rail. The Q44 may be thrown away. It makes the collector voltages of Q45 and Q20 equal when there is no signal. 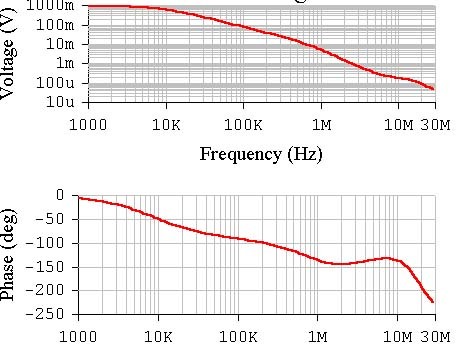 The second stage has low gain because the load resistors R23, R73 can not not have large values, which are determined by two Ube of output pairs. 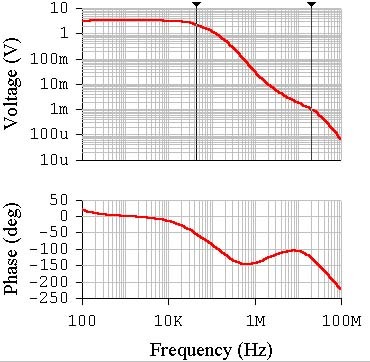 Using power MOSFETs can make possible higher values resistors. The amplitude input voltage is 1 mV. The overall open loop gain is only 3250. The amplitude graph is flat till 44 kHz (-3dB). 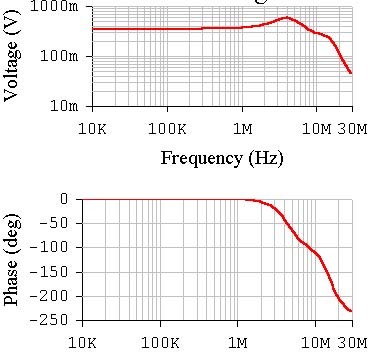 And a few words about thermal non-stability of this amp. This is caused by two reasons. First: the standing current of the second differential stage is defined only by low value resistor R68. This is a common defect of the two differential stages topology. This drawback can be overcome by feeding it from the more high voltage source of positive polarity (it may be +40 V). In this case transistor current source can be used instead of resistor. Having eliminated the temperature instability of the second stage we did not solve the whole problem. It can be seen that there are no components that provide the output transistors quiescent current thermal stability. That brings to their self heating. To stabilize the current the currents of the second or even first stages are to be controlled according to the output stage devices temperature. This leads to the changing of operation conditions of all (in the second case) or almost all transistors of voltage amplifier stages. So their frequency parameters can also change. The amp is suitable for class A operation of the output transistors. In that case we need to stabilize the mean current by some servo scheme. As it was pointed out the little gain of the second stage and of the whole amp is determined by low resistance of the second stage load. 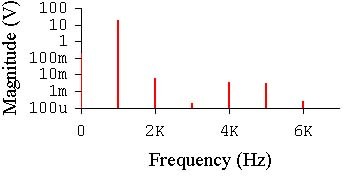 The resistance of R23=R73 is equal to sum of emitter-base voltages of the output pair divided by the half of second stage standing current. 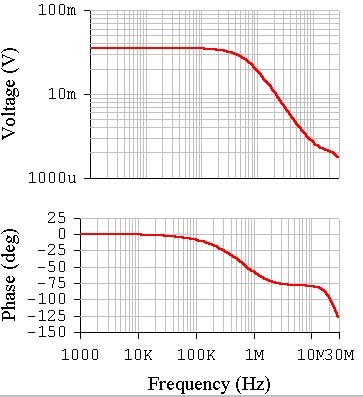 Mosfets have the Ugs (gate - source voltage) larger than the sum of emitter-base voltages of the output bipolar pair and the second stage gain may be higher. Such schematics can be found on the Australian site: ": www.vision.net.au /~anthony - "The D.I.Y. amplifier page"
And in conclusion let us switch the amp into A class mode (the output quiescent current is 5.09 A) by making R23=R73=470 ohms. C12=300 pF, the two new frequency compensation 20 pF capacitors from base to collectors of Q45 ang Q20. 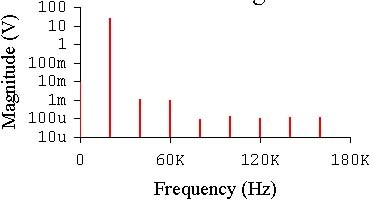 The THD at 1 kHz lowered to 0.017% but at 20 kHz the THD are 0.17%. In reality minimum two pairs of output transistors should be used to handle 5 amperes at 30 volts.